The mood was somber for Ifé Franklin of Roxbury after spending the night in the former slaves’ quarters. MEDFORD — Joseph McGill Jr. stood before the group to share his experiences sleeping in more than 60 slave quarters nationwide. What the African-American preservationist could not foresee was the stunning revelations that would unfold in a matter of hours. Three of the 10 guests who signed up to join McGill for a sleepover in the only freestanding slave quarters north of the Mason-Dixon line would acknowledge that their families enslaved Africans. “This is the highest concentration of descendants of slave owners that I have shared a space with overnight,” he added. McGill’s lecture on the Slave Dwelling Project he founded and the overnight that followed were the culmination of the Royall House & Slave Quarters annual Giving Voice program fund-raiser, in which donors paid $50 to hear McGill speak and $200 to sleep in the austere 18th-century Medford dwelling of the largest group of enslaved Africans in Massachusetts. He was not alone in mustering the courage to share the family secret and shame. Jamaica Plain poet Catherine Sasanov unearthed wills that proved title was held to 13 enslaved Africans in the Missouri Ozarks and up to 26 in Williamson County, Tenn.
“In my great-great-great-grandfather’s will, he basically said, ‘Sell ’em and split ’em up,’ ” she said. Like Sasanov, Ellen Watters Sullivan, 58, of Eastham, has written about her family’s ties to slavery. She recalled her father, a print journalist during the Civil Rights Movement, taking her to their family’s ancestral home in rural northwest Georgia and seeing a big house — and the little house out back. Others — like Robert Wolff, a professor of slavery, abolition, and memory at Central Connecticut State University, and Dee Mallon, a Newton textile artist — had other reasons to spend the night. For the last two years, Mallon, 57, has been writing a historical novel on indigo developer Eliza Lucas Pinckney and three enslaved Africans she owned. Ifé Franklin of Roxbury admitted she had reservations about sharing space with people who could have owned members of her family. 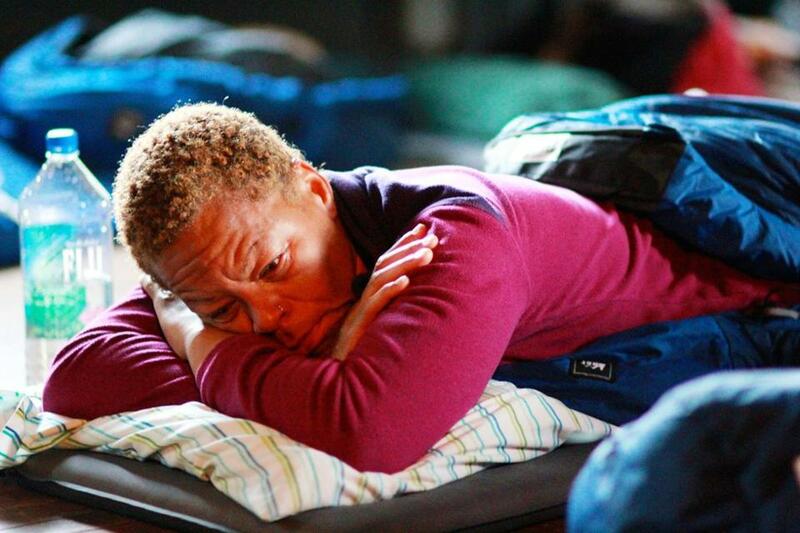 For Franklin, 54, who was one of the four African-Americans in the overnight group, the chance to spend the night where her ancestors once slept filled her with gratitude. She presented McGill with a gift of a small-scale version of a slave cabin at the center of her first solo textile art exhibit, “The Indigo Project,” which opened last fall in South Boston. Like the original 8-foot-by-8-foot cabin she created — covered in pieces of indigo-colored cotton – it pays homage to enslaved Africans who lived and died producing the dye and the fabric. Before the night was over, some pledged to financially support the efforts of the Slave Dwelling Project. McGill does not mince words whenever talk of reparations arises in relationship to his work. “For me to gain access to these places, I’ve got to stay focused,” he said, noting that a lot of owners of former plantations he’s appealing to get nervous around that word: reparation. Franklin said the slave-holding heirs in the room need to know that the discussion of reparations is not going away, nor should it. For video with this story, go to www.bostonglobe.com/north. Reach Clennon L. King at clennon@augustinemonica.com.